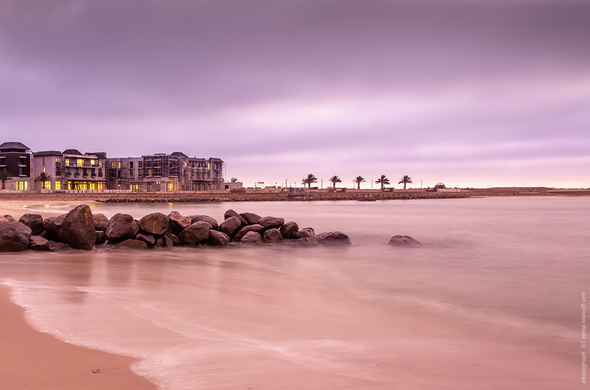 Strand Hotel Swakopmund is located on the Namibia Coast and forms part of the country's popular adventure destinations. International Airport followed by a 40min road transfer. Serviced by Air Namibia from Windhoek and Cape Town and SAA from Johannesburg. Via Swakopmund Airport by private charter and a 20min road transfer. Via Windhoek International Airport followed by a 4h road transfer or a 60min charter flight. Serviced internationally by Air Namibia and Condor from Frankfurt and regionally by SAA from Johannesburg & Cape Town, British Airways from Johannesburg, Angolan Airlines from Luanda and numerous other regional destinations such as Harare, Lusaka, Johannesburg, Cape Town, Victoria Falls, Katima Mulilo and Accra by Air Namibia and others. From Windhoek, take the B1 towards Okahandja and follow signs to Swakopmund. This is a 365 km drive and your journey is approximately 4 hours. From Walvis Bay, follow the signs to Swakopmund and travel along the Atlantic coast. This 35 km journey is a 40 minute excursion. From Etosha's eastern side, drive south to Tsumeb and to Otjiwarongo then follow signs to Okahandja and to Swakopmund. This 600 km journey is approximately 7 hours. From Etosha's western side, drive south to Outjo and Otjiwarongo and follow signs to Okahandja and to Swakopmund. This 519 km journey is approximately 6 hours long. In Swakopmund itself, follow Sam Nujoma Avenue towards the Atlantic Ocean. Turn either into Strandstrasse or Ben Girab Avenue and follow towards the Atlantic Ocean. Strand Hotel Swakopmund will be right at the Mole.